As the name implies, a "rider" or operator is carried in an electric rider forklift. Some of these Class I lift trucks have a caged platform for the rider to stand on, while others have a caged seat. Most electric rider lift trucks are designed for indoor use or on flat, smooth and relatively level surfaces. Stand-on (or stand-up) electric riders are shorter than sit-down riders, because accommodation is not needed for seating. They are designed for applications where the operator will be frequently entering and exiting the vehicle. 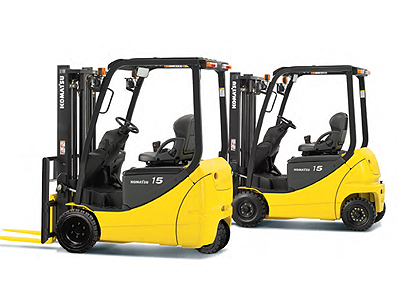 Reconditioned electric rider forklifts represent excellent value for money. Electric forklifts typically have very long life spans, having been used in controlled, indoor environments. They have not been exposed to the elements or subjected to rough terrain. Electric powered forklifts are not subject to the wear and tear of internal combustion engines. This helps minimize the cost of reconditioning the lift truck - a savings we pass on to our customers when we offer electric rider forklifts for sale on our website. Before you decide on a reconditioned electric rider forklift, give careful consideration to your needs. How narrow are your aisles? How high are the passageways the lift truck must pass through? How heavy are the loads the forklift will typically be carrying? We have dozens of different types of reconditioned forklifts in stock and can help you find the perfect one for your particular needs.